Our Kits include detailed step-by-step instructions using many photos and illustrations. Each kit comes complete with every component except tools and glue. 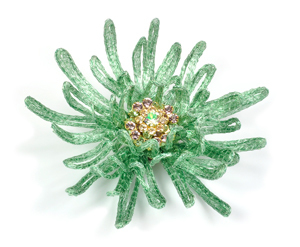 epoxy clay and SWAROVSKI ELEMENTS. one yard of 6mm WireLace make a larger flower with less petals or smaller one with more petals. 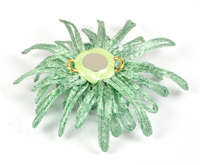 Sculpt the petals to curve up, down, straight or a combination - it is all up to you! 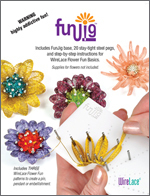 FunJig Kit Includes: base, 20 stay-tight steel pegs, and step-by-step instructions for three WireLace Flower Fun Basics. Supplies for flowers not included. Attaching Flower: Use magnets or a pin OR create your own method. 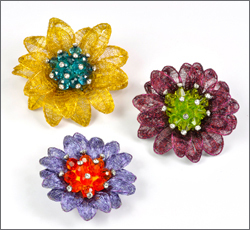 SWAROVSKI ELEMENTS as desired: Shown with Crystal Headpins and various 6mm Beads. Mod Podge Gloss, make-up wedge sponge to apply Mod Podge. WireLace Flower Fun Basics instructions included with FunJig to make 3 flower sizes. Each flower uses1 yard 6mm WireLace. FunJig - Warning,highly additive fun! 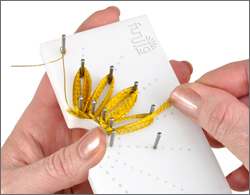 Go from frustration to fun with the FunJig! Ingenious Peg Design - Tapered pegs stay tight -- even when turned upside down! Change Pegs Easily - Simply push-in, pull-out, no tools needed. comfortable to hold and easy to maneuver. Flowers - all using 1 yard (36 inches) of 6mm WireLace. FREE Blank Template - Copy and keep track of your own flower designs. Generous Amount of Pegs - Includes 20 pegs so have lots of options. Long Peg Length - 1 inch pegs let you create multiple layers. Layer two colors and you will have fabulous, multi-colored flowers fast! Durable - High grade resin will not crack and is easy to clean. Portable - Small size for fun on the go! Requires FunJig & Flower Fun Basics for complete instructions. Uses 2 1/2 yards of 3mm WireLace. Photo shown with magnet and jump rings for easy attachment - use a pin or create your own method.